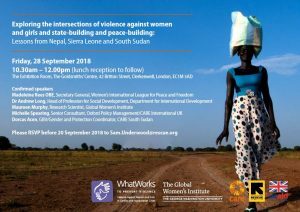 This event launches a study on gaps in evidence and understanding on violence against women and girls during post-conflict transition. Join Network Women Weaving the Future for their first international women’s conference. This event aims to initiate a dialogue around the inclusion of young women in diaspora groups in discussions on Women, Peace and Security. Contact info@womenpp.org if you are interested in attending the event. Join the LSE Library for a roundtable discussion with academics, activists, writers and politicians reflecting on Black British Feminism. This Global Institute for Women’s Leadership event explores the barriers and challenges for women in accessing leadership roles. 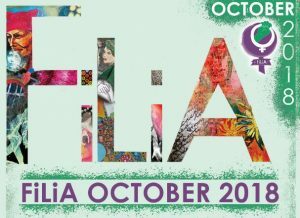 The FiLiA 2018 conference brings together sisters taking down patriarchy, fighting injustices across the world, fighting violence towards women, pay disparity, discrimination against refugees, racism, classism. Grace John Kenyi Geri, from the Community Empowerment for Progress Organisation (CEPO), briefed the UN Security Council on South Sudan from a civil society perspective on 18 September 2018. Read her statement here. The CEDAW Committee and the Special Representative of the Secretary-General on Sexual Violence in Conflict signed a Cooperation Framework on 20 July 2018. The Cooperation Framework aims to advance the rights of women and girls by combating conflict-related sexual violence and supporting the relevant WPS UNSC resolutions. Nepali civil society is preparing for the Shadow Report on the Implementation of Nepal’s National Action Plan and other policies on WPS. A new network of women mediators spanning the globe is now seeking applications from prospective members! Coordinated by Conciliation Resources, WMC is a platform for the peer-to-peer exchange and learning of women mediators across Commonwealth countries. Membership is open to any women who are involved in mediation in the community, national, regional or global level; who are interested in sharing their experiences and expertise; and who are citizens of a Commonwealth country. The first deadline for applications is Friday 5 October 2018. The Gender and Development journal is seeking contributions for its next edition examining the theme of humanitarian action and crisis response through the lens of gender equality and women’s empowerment. This edition will be co-edited by UN Women in collaboration with its Humanitarian Action and Crisis Response Office. Please send a paragraph outlining your proposal for an article in an email (no attachments) to Caroline Sweetman (csweetman@oxfam.org.uk) by 30 September 2018. Oxfam and the Women and Peace Studies Organisation have launched the report “Afghan Women Police: Tomorrow’s force for inclusive security“. It includes assessment of the implementation of Afghanistan’s National Action Plan on Women, Peace and Security. The Global Network of Women Peacebuilders has published a poilcy brief contributing to the discussions on synergies between CEDAW and the Women, Peace and Security resolutions, including analysis on the monitoring, reporting and implementation of both frameworks. 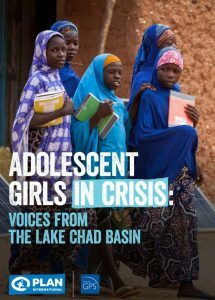 Plan International has launched a report highlighting the sites of insecurity for adolescent girls, as well as the ways in which they respond to and continue to strive towards building safer communities for themselves and those around them. This handbook is a resource for international work relating to gender equality and all women’s and girls’ full enjoyment of human rights. Inclusive Security have launched an expanded set of free online training resources on Women, Peace and Security available here. GAPS provides the Secretariat for the All-Party Parliamentary Group on Women, Peace and Security (APPG-WPS). The APPG-WPS holds events throughout the year that explore the situation for Women, Peace and Security around the world through thematic or country focuses. If you would like to be notified of upcoming events through the APPG-WPS, please inform us at appg-wps@gaps-uk.org.